Dashbot recently surpassed 140 million messages processed. We took a look back at a previous report on common messages sent in to bots to see how messaging has changed over the past five months. The following metrics are based on Facebook bots on our platform. Looking at the most common messages sent in to bots, we can see “hi” and “hello” are still at the top. 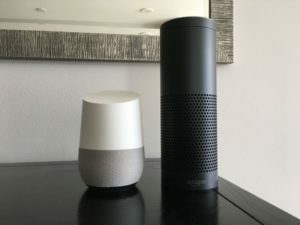 It makes sense — bots are conversational interfaces and hi and hello are natural ways to start a conversation. In October alone, 73% of bots received a “hi” and 56% received a “hello.” Adding support for these messages can help increase engagement. Help is also a fairly common message sent in to bots. In October, nearly 40% of bots received a “help” message. Users want to know how to interact with your bot and what it can do. Does your bot have a help response? This is a great opportunity to provide info on what your bot does, and how users can interact with it. We’ve mentioned this before — providing a personality for your bot can increase engagement. We took a look at how often users try to get to know the bots they’re interacting with — as if they are a person. Nearly 19% of Facebook bots have had users ask the bot its name. At the same time, about 5.6% of bots were asked whether they were male or female! Is this real? Interestingly enough, about 11% of bots have received a message asking whether the bot was a real person or not. One of the beauties of conversational interfaces on messaging platforms is the ability to send in unstructured data. Users are sending in more than text — they’re sending images, video, audio and more. Stickers are are one of the ways users express themselves and communicate with bots. 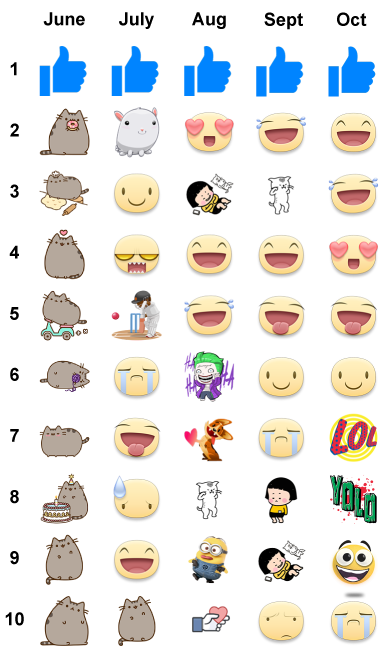 Below is an updated version of the most popular stickers users send. 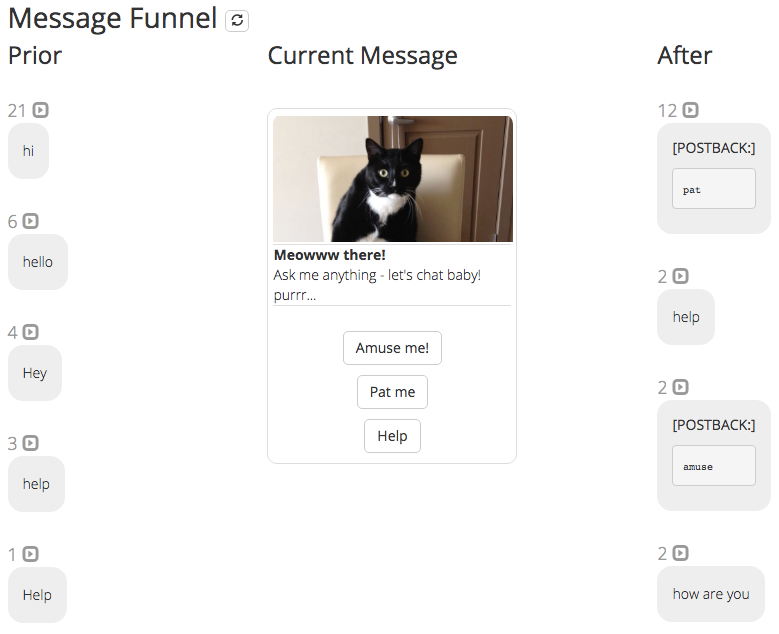 There are multiple ways into the funnel on Dashbot — including from the Top Messages In and Out reports as well as from the Transcripts themselves.